A particular sculpture displayed in a particular place reflects a special meaning of the place. People remember and honor important events happened in the area in the past, making a statue or monument in the area. 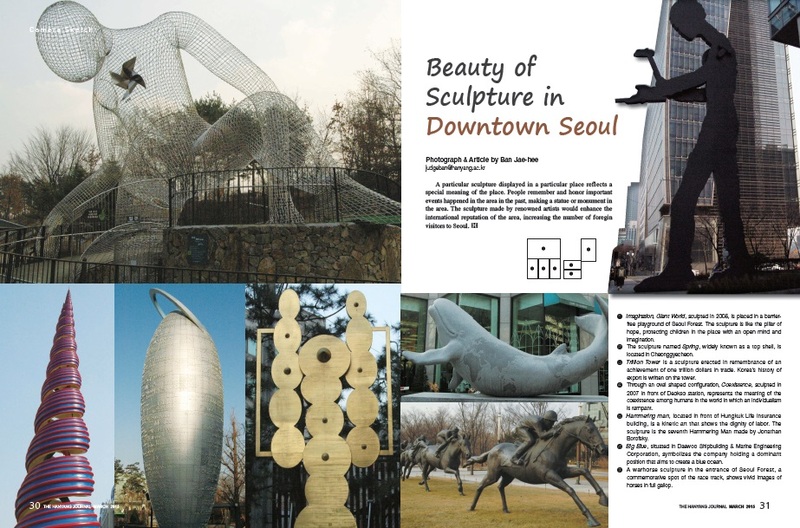 The sculpture made by renowned artists would enhance the international reputation of the area, increasing the number of foreign visitors to Seoul. 1 Imagination, Giant World , sculpted in 2006, is placed in a barrier- free playground of Seoul Forest. The sculpture is like the pillar of hope, protecting children in the place with an openmind and imagination. 2 The sculpture named Spring , widely known as a top shell, is located in Cheonggyecheon. 3 Trillion Tower is a sculpture erected in remembrance of an achievement of one trillion dollars in trade. Korea’s history of export is written on the tower. 4 Through an oval shaped configuration, Coexistence , sculpted in 2007 in front of Deokso station, represents the meaning of the coexistence among humans in the world in which an individualism is rampant. 5 Hammering man , located in front of Hungkuk Life Insurance building, is a kinetic art that shows the dignity of labor. The sculpture is the seventh Hammering Man made by Jonathan Borofsky. 6 Big Blue , situated in Daewoo Shipbuilding & Marine Engineering Corporation, symbolizes the company holding a dominant position that aims to create a blue ocean. 7 A warhorse sculpture in the entrance of Seoul Forest, a commemorative spot of the race track, shows vivid images of horses in full gallop.